Did you know Melitta Benz invented the coffee filter? 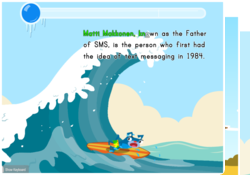 Who is the father of text messaging? Kids learn about 3 cool inventors in this quick typing game. They will practice typing symbols, numbers, and capital letters as Floyd surfs a big wave! Have them play over and over again to beat their previous words per minute!